This is one of those fascinating stories in which Jesus’ actions could be easily misunderstood. 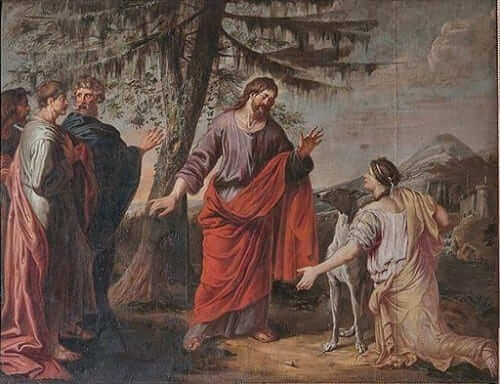 As the story unfolds, Jesus replies to this woman’s desire for help by stating, “It is not right to take the food of the children and throw it to the dogs.” Ouch! This initially sounds rude. But of course it wasn’t since Jesus was never rude. If you desire to walk down the road of holiness, this story is for you. It’s a story by which we come to understand that great faith comes as a result of purification and unwavering trust. This woman states to Jesus, “Please, Lord, for even the dogs eat the scraps that fall from the table of their masters.” In other words, she begged for mercy despite her unworthiness. It’s essential to understand that at times God appears to be silent. This is an act of deep love on His part because it is actually an invitation to turn to Him on a very deep level. God’s silence allows us to move from a faith fed by accolades and emotion to a faith fostered by pure trust in His mercy. Reflect, today, upon those moments in life when you feel as though God is silent. Know that those moments are actually moments of invitation to trust on a new and deeper level. Make an act of trust and allow your faith to become more fully purified so that God can do great things in you and through you! Lord, I acknowledge that I am unworthy of Your grace and mercy in my life in every way. But I also acknowledge that You are merciful beyond comprehension and that Your mercy is so great that You desire to pour it forth upon me, a poor and unworthy sinner. I beg for that mercy, dear Lord, and I place my complete trust in You. Jesus, I do trust in You.